For everyone going through KWS (Kate Withdrawal Syndrome), we have a few tidbits that may be of interest, especially the first item. It involves the necklace Kate is wearing below. The pave diamond pendant necklace Kate has worn with some frequency is probably the one item we have been asked about the most of late. With gratitude to a lovely reader who wishes to remain anonymous it seems we have an answer to the mystery. 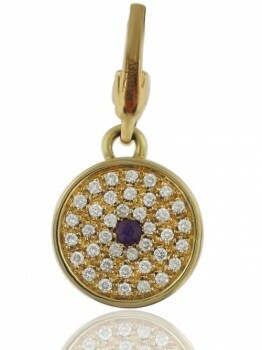 It is the Asprey Button Pendant, we show it below in yellow gold with whats appears to be an amethyst center stone. 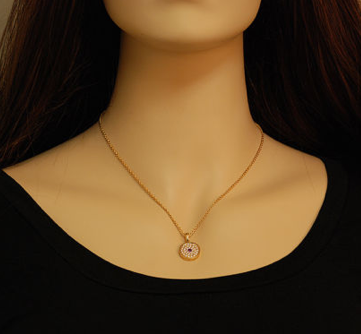 Ayvee did some scouting and shared an eBay auction for the necklace shown above, the Buy it Now price is $1899.95 USD. Both items are being sold by Luxury Bazaar, a firm with which I am not familiar. Ayvee shared another link to these matching earrings, also from Luxury Bazaar, but in 18K white gold. The ‘special price’ for these is shown as $2030 USD. One other jewelry note, the mainstream media has picked up on a story we initially reported back in June, this one involves Kate’s sapphire and diamond earrings. We also want to thank the helpful Carissa at G-Free Runner, she tweeted us about this post on her blog that examined the issue as well. Well, this Sunday The Mirror carried a story, “Kate Middleton given Diana’s favourite earrings by Prince William“. Below is the entire story. “PRINCE William has given a pair of his mother Princess Diana’s earrings to new wife Kate. The Duchess of Cambridge wore the diamond and sapphire gems during the couple’s official visit to Canada and the US. Kate, 29, had Diana’s heavy studs “which match her cluster engagement ring“ remodelled into drop earrings. Kate wore them for the first time when she and Wills watched Andy Murray from the Royal Box at Wimbledon last month. The Mirror’s story has been picked up by thousands of media outlets, many of you have probably seen some of the reports. These photos illustrated the story. To see much better photos, once again we recommend Ayvee’s section on Kate’s jewelry, part of her Diana’s Jewelry site. We are happy to have the mystery necklace taken care of, with special thanks to our tipster and Ayvee! Where can I find a pair (fabulous phony) of the drop earrings? Price is an object, but I want them to look as real as I can. Did anyone else notice that in the first picture, it appears that Kate is wearing her engagement ring on her middle finger..
That’s definitely her ring finger. Yep, been going through Kate withdrawal for sure. I love this website and have been showing it off to everyone I know. I tried to watch the segment on GMA but I must have missed because I had to leave my obsession behind and actually go to work. Btw, I have been wearing pantyhose since I was about 8 and I am 27. So, I say pantyhose never went out of style! Thanks for the info about that pave pendant necklace. The sapphire earrings are beautiful, but am I the only one that thinks they don’t hang well? When you first ran photos of those earrings, I thought the posts don’t sit right on the Duchess’ earlobes. Still feel this way. In regards to those earrings of Diana’s that she fashioned into drop earrings. Did she not debut them in her Royal Tour 2011 official photo and not at Wimbledon? Kate is quite the master at mixing and matching old and new! It’s a skill and there’s something about it that makes her seem accessible though she is a Duchess and future Queen. I can appreciate it stylistically, but also I think it is endearing. Any ideas on those gold link bracelets she’s been seen sporting? I know Tiffany’s has a few options but was wondering if anyone tracked down others. Kinda random, but do you think you could start showcasing Kate’s hair and makeup looks? I would LOVE to know what products she’s using! Well, I know she uses karin herzog skincare and has taken a few make up lesson before the wedding. Honestly, make up is one of the few thing I don’t like in Kate’s style …. I think she should avoid those heavy black eye lines (pencil? eye liner?) and smudge a little bit more her blush. Great detective work, guys 🙂 The disc pendant is another example of the way Kate likes to reuse old favourites- she’s been seen wearing it for some years now. Just found this on eBay. 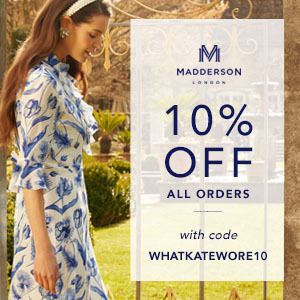 It is a very close replica/style of the Issa Purple dress that Kate wore. It seems like the seller also got the Shola dress, too. This seller has excellent feedback. Worth checking out! Severe case of KWS here. Thank you for providing tidbits (and sparkly ones at that!) to us sufferers. Speaking of, I adore the Kate modification to Diana’s earrings. What a lovely gift & way to make them both more modern & her own. You are right about KWS!! OK, the earrings are a nice touch and everything, but the other thing I can’t help noticing is the eyeliner issue. I never liked it on Kate, it makes her look much older, but I just now realized that Diana used to do this on several occasions. Is it a coincidence or Kate is trying to hard here. Back in the 80s that look was all the rage. We all wore blue eyeliner on the inside of our lids/lashes. I have noticed that, too! She – and her sister – apply the eyeliner all around the eye. Up close, it really ages all of them. I didn’t realize that Diana used to do that, too. I think it’s a coincidence – of all things to copy from Diana, putting eyeliner all around the eye would be pretty unusual! I think it is not so much a coincidence as a requirement for all the photographs. It’s an old stage trick, so that you don’t look washed out and squinty when a picture is taken from far away. If you look at a picture that’s not so close-up, you can see how Kate’s & Diana’s eyes stand/stood out. That’s because of that dramatic eyeliner. I’m curious to see if Kate ends up with any of the other sapphire pieces that Diana owned. I’m also looking forward to see what Kate wears to Zara’s wedding this weekend. I hope she doesn’t wear anymore of Diana’s favorite pieces…out of respect for Diana and the rest of the world that loved her. I read all of the newspaper articles and was thinking, “Duh!” Good work on the necklace! I am severely suffering from KWS…thanks for another fabulous article!! Wish I had $2K to drop on this necklace, it is quite lovely. At least we know what it is now. Yeah! Another Kate fashion mystery solved! !